Concrete Mix | Salmon Bay Sand & Gravel Co.
Premixed concrete is available in 60lb sacks which have a yield .45 cubic feet. 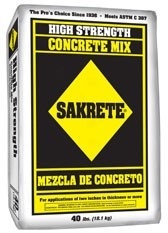 Sakrete High Strength Concrete Mix is a pre-blended mixture of sand, coarse aggregate and cementitious materials. For new construction or repairs where concrete thickness exceeds 2 inches….. Just add 2 1/2 quarts of water per 60lb bag.